Oil on canvas, 65 x 80 cm. The theme in this painting stems from The Book of Genesis in the Old Testament. The painting depicts Hagar and Ishmael, an Egyptian servant girl and the son she had with Abraham. It is the story of God, who puts Abraham to the test twice to see how strong he was in faith. He asks Abraham to sacrifice what is most dear to him, namely his sons Ishmael and Isaac. 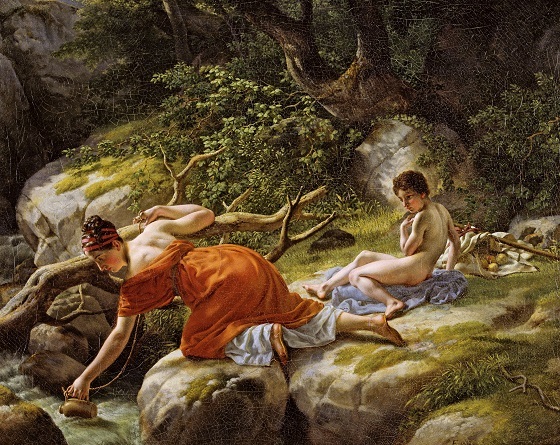 Eckersberg has chosen to depict the moment when Hagar and Ishmael have fled into the desert in safe perdition, when a spring appears as their rescue. The desert in the painting is therefore more reminiscent of a lush, Nordic forest landscape than of a sandy, rocky desert. The painting is carried out in Paris during the period where Eckersberg was studying under the neo-classical painter Jacques-Louis David, and the classically elegant figures are clear signs of this. Hagar is graceful and sensual, Ishmael shy and almost luminous on the rock in the background.